Roberto Trevino, Delia Cardenas, Diego Bernal, David Bogle and ___, left to right. Photo courtesy City of San Antonio Transportation Construction and Infrastructure (TCI) graphic designer Shannon Pacheco-Caldera. 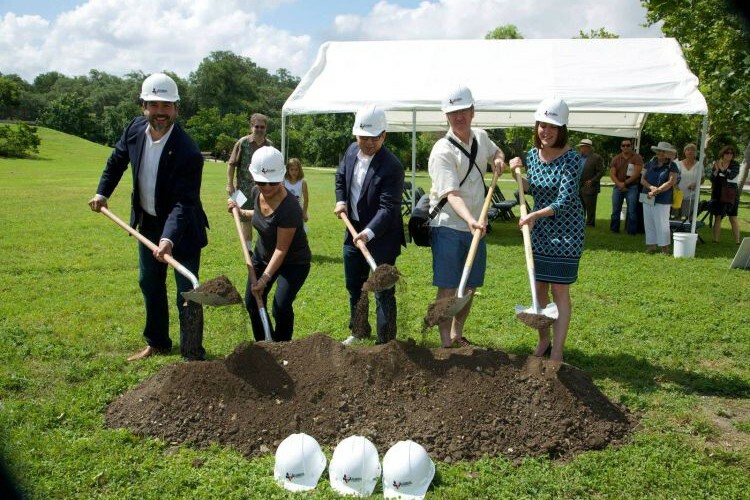 I attended the groundbreaking ceremony for the improvements at the park last week, and was surprised when our former District 1 Council representative, Diego Bernal asked me to join them in the shovel line. 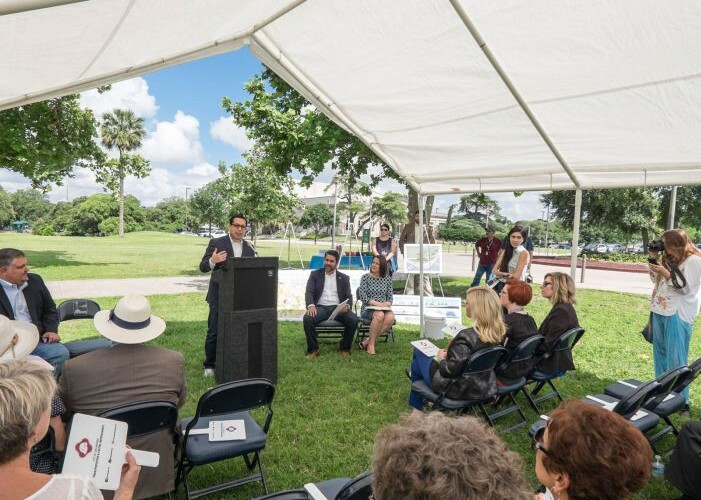 “Diego,” as he insists all his constituents refer to him, was the driving force behind the initial bond allocation for the park and subsequently found additional funding that was required to round out the scope of work to include perimeter improvements along North Flores Street. It was rewarding to have been asked to join in for the photo alongside our new District 1 representative Roberto Trevino, another neighbor and CoSA Parks and Recreation. Through several public meetings, public input managed to help steer the design development of the project. I, along with several other neighbors and professionals, voluntarily advised the neighborhood association, as well as the councilman, on some of the technical and urban design-wise aspects of the improvements. Some of the benefits of citizen involvement included a revisiting of the San Pedro Springs Park Master Plan (abbreviated as it was) with public input, promotion of native plant materials, prevention of construction that would later be required to be removed when future phases of work gets funding, and removal of the existing perimeter sidewalks along North Flores Street where the most popular street parking is. The new lighting will have LED technology lamping, but in matching “historicizing” lamp poles. Along the new walking trail and around the perimeter of the park, this should provide a visible improvement to the night time atmosphere of the park. The hope is that this near-perimeter fitness trail feature and lighting will attract more activity to the park and health to our neighborhood. The next time bond money becomes available for park improvements, I hope there will be funding for a planning process to update the park master plan and develop a prioritization from public input before the decisions about what will be built next are made. 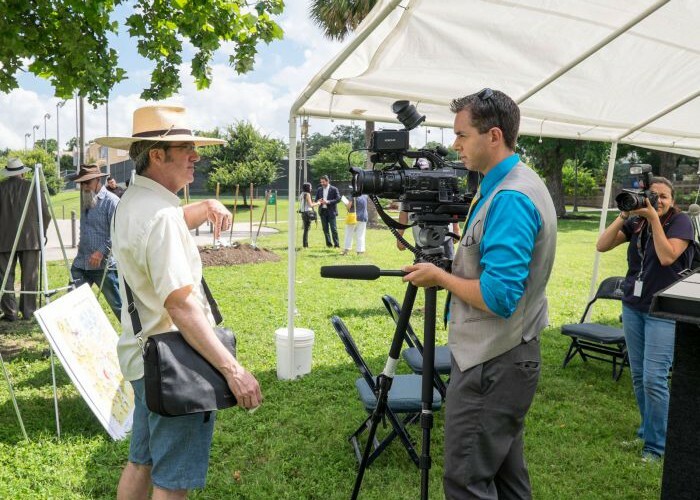 KENS5 reporter interviewing David Bogle about the public input process. 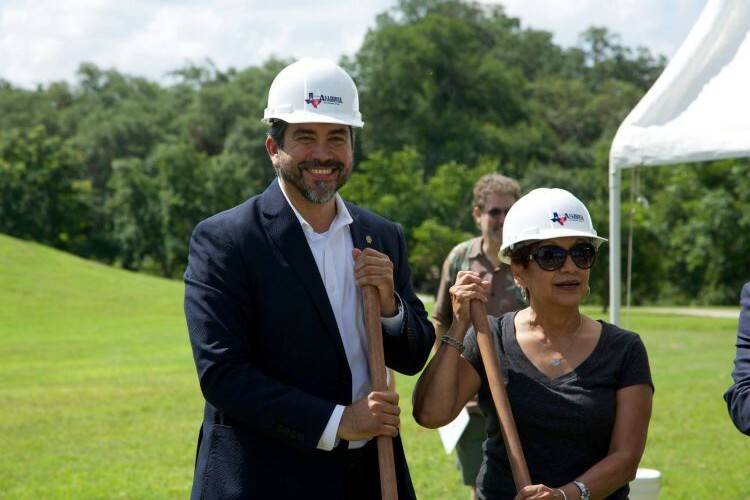 District 1 Council Representative Roberto Trevino and fellow Alta Vista neighbor Delia Cardenas. New Trail at San Pedro Springs Park Set to Open by December. Posted in blog, events, urban. RSS 2.0 feed.